Heading out to watch a fireworks show (it is the 4th of July you know) and plan to use your iPhone as your primary camera? Be sure to use these five tricks for taking the best possible fireworks pictures with your iPhone… it’s not quite a DSLR, but with some proper technique you can still capture great firework images with the iPhone. HDR takes multiple photos at different exposures, then automatically combines them together into a single image using software. For shooting something like fireworks, HDR can be particularly advantageous because the different exposure images often capture light-trails and other details that a single image may not capture. Turning HDR on is easy, once you’re in the Camera app just tap on the “HDR Off” button until it’s highlighted in yellow and says “HDR On”. Once you get a picture or two that you’re happy with, use Exposure Lock to lock in the exposure details so that your future fireworks shots will come out just as good. Exposure Lock is super easy to enable, just tap and hold on the camera screen in the region where you want to lock the exposure and lighting to. You’ll know it’s on when “AE/AF LOCK” appears at the top of the Camera screen in yellow. Using Exposure Lock also locks the focus, which for shooting distant objects doesn’t matter quite as much, but as of now there’s no way to lock exposure separately from focus. Shooting often is the dirty secret of most professional digital photographers, they make take 100 pictures and only keep a handful that turned out particularly great. You can apply that same theory to your iPhone shots when capturing tricky lighting situations like fireworks. There’s not much to this, so just take a lot of pictures with HDR, and later in the evening when the firework show is over you can go through and cull the images you don’t want anymore. SlowShutterCam is a third party app that allows you to take light trail and motion blur images by leaving the iPhone lens ‘open’ like a traditional camera. Slow Shutter Cam works surprisingly well, but for best results you’ll want to keep the iPhone very still, either using a tripod (yes they make mini-tripods for the iPhone) or by improvising and leaning the iPhone against an object like a picnic table or an upside down hotdog bun. Whatever you use and whatever you try, have fun out there! Enjoy the fireworks! How about you leave the US centric rambling out of your post for god’s sake? The rest of the world don’t give a fat rats about July 4th. Just give us the facts please. 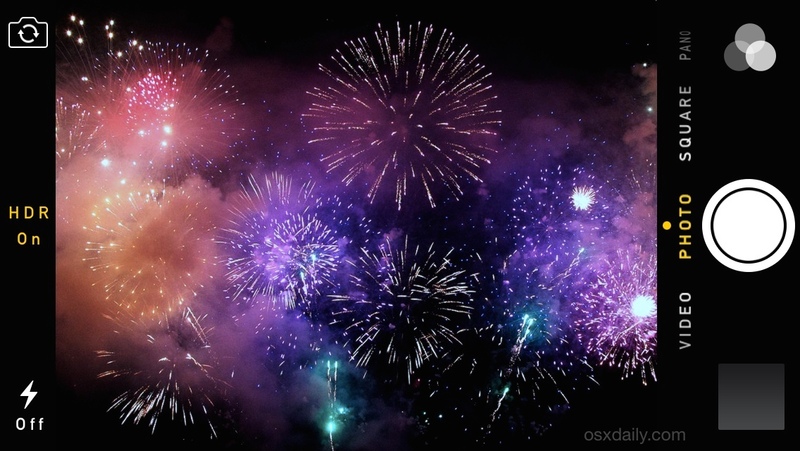 The tips apply to taking pictures of any fireworks with the iPhone, today just happens to be an occasion to post about it since there are a lot of readers watching a firework show this evening. 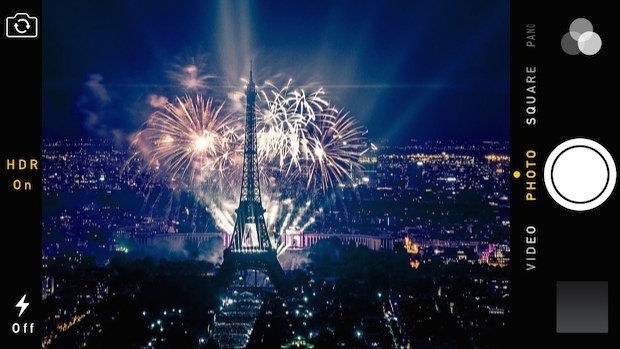 Point is taken, but this is certainly not intended to be US-centric, as you can see one of the photos is of a firework show behind the Eiffel Tower in France. When the towel heads come to your country to cut your head off the USA will let them. Don’t come crying to the U.S. for military support. this racist idiot does not speak for all of us Americans. Thank you for the tips, in my experience, photographing fireworks is tricky. Kevin- why don’t u leave the rambling out of your post. I really don’t care whether the rest of the world cares about our holiday or not. I guess it was just too hard for u to simply say “thanks for the tips”. Moron! Paul- great tips, thank you! Clearly you are jealous of me. Stop trying to ruin my birthday. Very useful – if not for tomorrow in the UK, the Edinburgh festival is combining next month, which has great fireworks every night all through August. BTW, if you need something to proper up your phone (ie, the round edges on the iPhone 6 don’t support it standing upright or on its side) You can use the wall adapter with the prongs pointing up and place your phone on it’s side or up and down between them. Great tips. Even tho I am American I have taken fireworks photos all over the world. Two fav shows: Berlin New Years Eve and Rhinefalls in Switzerland on their version of 4th of July –that’s sort of how our friends their explained it. Happy 4th of July for everyone all over the world esp if u just watched Will Smith in Independence Day!!!! Great tips, just in time. BTW, I just shot the Capital Fourth fireworks on my TV using my Iphone 5c using your HDR and other tips and some of them are first rate … almost like being there! Thanks! Paul, your tips are great. Thank you! Now here’s one for you. The next time someone posts an ugly, divisive rant, just delete it. Keep the rest of us from getting ulcers instead of just enjoying what you write plus helpful comments from others. Thanks for the kind words FrequentReader, and that’s great advice!